Get your prescription for a MEGA-UNIDOSE® of SHOCK TREATMENT! 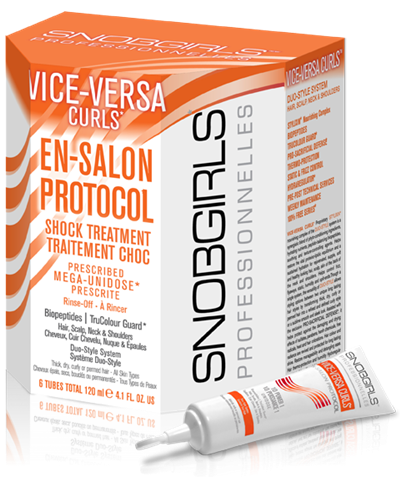 The best thing you can possibly do for your hair and scalp, Snob Girls En-Salon Protocol takes deep conditioning to whole new level. En-Salon Protocols are intensive Shock Treatments of a mega-dose of natural biopeptides, powerful antioxidants, phyto-nutrients, multivitamins, essential lipieds, hydrating agents, and exclusive proprietary nourishing complexes. They help to nourish, repair, reinforce, and protect the essential internal and external structures of hair. They help keep scalp, and skin of the neck and shoulders soft, smooth, supple and healthy. These targeted treatments help to boost and maintain the integrity of the natural hydrolipidic protective barrier of hair and scalp for maximum protection and moisture before, during and after technical services, like color or perming/straightening. The also help fight the effect of time and protect against the damaging free radicals generated by UV rays, harsh chemicals, and pollution. Microscopic biopeptides help regenerate and stabilize the optimal protein level deep within the cortex of the hair fiber for maximum strength and resistance against breaking. Stabalized intra-cortical protein level helps to assure optimal, homogeneous, predictable and long-lasting results following technical services and colorations. Help trigger new collagen production for a smooth, supple and healthy scalp and skin. TruClour Guard anti-fading effect helps seal, preserve and prolong the color and radiance of clor treated hair. Weightless creme-gel texture. Non-tacky and residue-free. SHOCK TREATMENT IS NOT JUST FOR YOUR HAIR!Rich in potent natural phyto-antioxidants, it moisturizes, nourishes and conditions while protecting against premature skin aging, environmental chemicals and pollution by neutralizing free radicals. It helps promote the natural healing of skin. It protects, nourishes and helps repair skin's natural hydrolipic barrier and restores normal skin pH for optimal natural defense against the daily environmental assaults, to restore normal healthy skin. Biopeptides + Vitamin C + Retinyl Palmitate Proprietary System helps trigger and boost production of skin's natural collagen for optimal texture, resilience, suppleness, elasticity and smoothness while contributing to the reduction of the signs associated with premature skin aging. 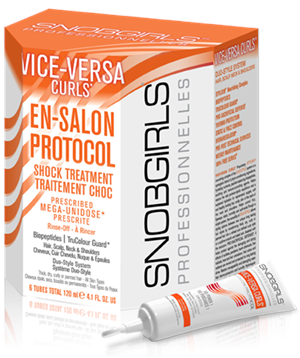 VICE-VERSA CURLS Prowash for hair, scalp, face and body. VICE-VERSA CURLS Masque Creme for hair, scalp, face and body.